The Commission also has told the Department to move forward with plans for additional multi-use fields at Veterans Park, Davol said, and she expects a request for qualifications for construction manager should go out in the next two weeks. Committee member DeeDee Gaines said a brief ceremony will be held on Sunday celebrating the reopening of the Bark Park and that a Dash for Dogs 2K fun run and walk and a 5K race will follow at Veterans Park. All of the proceeds of the Dash for Dogs will be for improvements and amenities at the Bark Park, Gaines said. 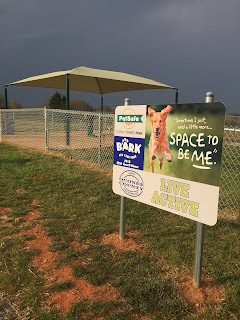 The Bark Park, an off-leash area for dogs, reopened late last year after upgrades funded in part by a $25,000 grant to the county by PetSafe, a manufacturer of electronic pet-training products. Gaines said a representative of PetSafe is expected at the ribbon-cutting ceremony to be held at 1:30 p.m. at the facility, which is at the very rear of Veterans Park. 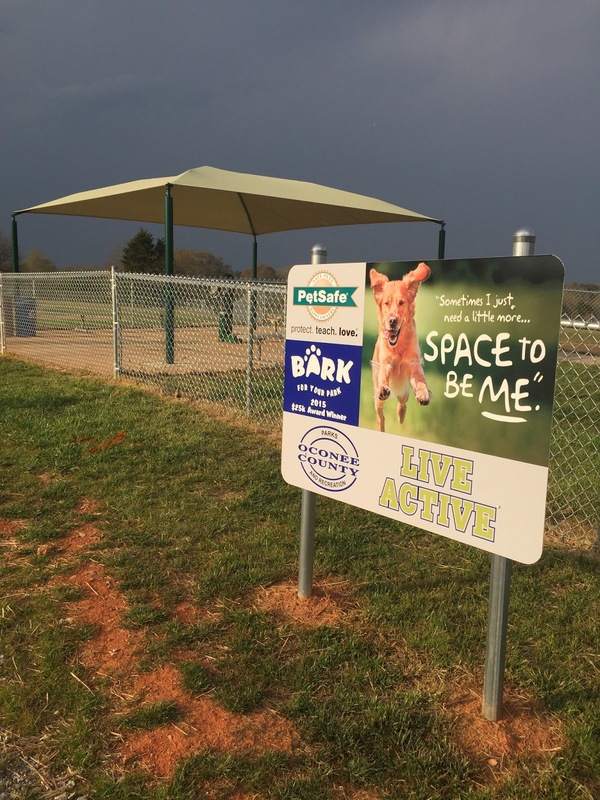 Parks and Recreation Director John Gentry told the Board of Commissioners last August that improvements to the fenced dog area were being funded by the PetSafe Grant and $7,000 in donations. The improvements included a covered shelter area, additional watering areas, and divisions of the open field to accommodate dogs of different sizes. The Dash for Dogs 2K will begin at 2:30 p.m., and the 5K will begin at 3. Each participant can bring a dog, provided the dog is vaccinated and on a leash that is no longer than 6 feet. Registration is $20, and the event will take place rain or shine, according to Gaines. Additional information about the event is available online at www.active.com. In the search window, type in Dash for Dogs. Davol told the Citizen Advisory Committee that the Board of Commissioners had not authorized a master plan for the county’s parks, despite the request by Gentry and the Committee for such a plan. The external review will be based on data gathered by the Parks and Recreation Department over the last three years on usage, park fees, and staffing. The review also will ask, “Are we able to meet future demands?” she said. The last time any study of this sort was done was in 2004, according to Davol. The Board of Commissioners agreed to put work on the multi-purpose fields “on the fast track,” Davol told the Citizen Committee. The fields have been graded, but some re-engineering needs to be done based on the rock found in that initial construction process, she said. Davol said it probably will be January of 2018 before any construction will begin and the Fall of 2018 before the fields can be used. Davol said nothing has been done on the proposed additional tennis courts. Funding for the multi-purpose fields as well as for the tennis courts would come from the voter-approved Special Purpose Local Option Sales Tax, according to Davol. The meeting of the Citizens Advisory Committee on Recreation Affairs began at 5 p.m. at the Community Center in Veterans Park. Leslie Hunsinger, chair of the Committee, called the group to order. OCO: Recreational Affairs 3 21 2017 from Lee Becker on Vimeo. All is not well in Parks & Recreation. Too much expected of too few with politics reigning supreme over simple maintenance. Easy decisions delayed due to second guessing. "External reviews" from "experts" floating in, making reports which are ignored due to budgets and political considerations, and soon forgotten. Perhaps the new leadership will pay attention, but only if sufficient funds will be allocated to true upgrades. Like the Animal Shelter, the costs will be surprising. But a thriving Parks & Rec segment is a far larger and more important issue. they can't say that John Gentry didn't try to tell them. And who better to know than him? Maybe someone from outside can finally give us a report on how many out of county individuals Oconee County taxpayers are subsidizing. In the advertisement ( which I do not understand why this is necessary if the system is already overburdened) for the summer program, there was no reference to Oconee county being given priority while the Athens-Clarke ad clearly stated county residents first. Unless I missed it, I did not see what the study would cost...this time. There have been several in memory. The results are always picked over for politically expedient tidbits. Residents of Oconee take their recreation seriously. Will they come off the hip? Davol said the costs are not yet known. Parks & Rec should not be in the day care business. They charge $5.00 per hour for day care. They call it "after school activities". Can anyone tell me how $5.00/hr covers transportation,food, and employees? Tax payers should not responsible for subsidizing day care for someones rug rat. Get rid of it. Anyone that doesnt pay property taxes in the county should be barred from using the facilities. It seems care about out of county usage as much as the school board does. Oconee County is fortunate to have one of the most respected parks & recreation departments in Georgia. After school programming is a common parks & recreation department offering. Out of county facility usage? Seriously? That's an issue? Back it up. Provide some data. I guess I shouldn't walk around the park walking trails with my mother; she doesn't live in the county. "someones rug rat"??? Stay classy, rightway1974. Look at the tags next time you are at one of the parks and see how many out of county people are there. If they dont pay property taxes in Oconee County then they should not be using county facilities. If they are going to offer day care no matter what they call it, they should charge a fee that is enough to cover expenses. Yes they are someones rug rat and I am not responsible for supporting them. As for the after school and summer day camp program, in 2016 OCPRD generated $535,999.02 in program revenue with expenditures of $326,234.64. That is a net revenue of $209,764.38. Impressive, and a needed community amenity for parents. We're lucky to have the staff we have at OCPRD.